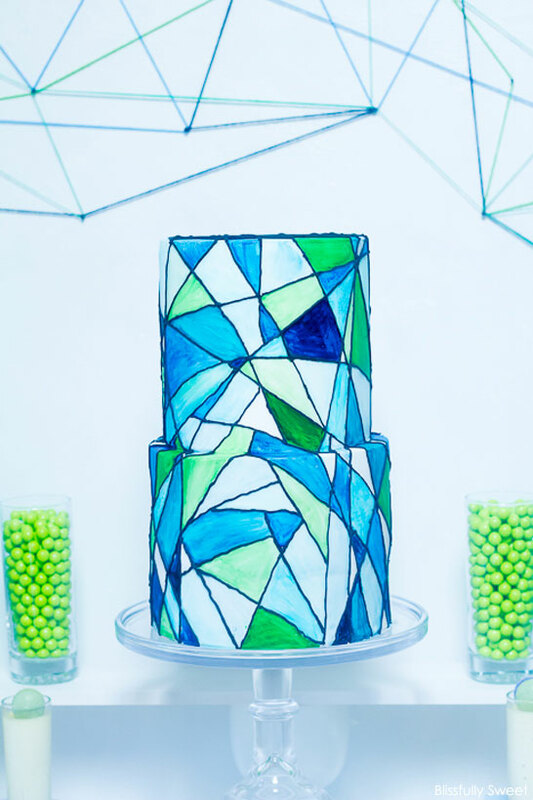 If you’ve ever planned a First Communion or Baptism celebration, you know what a challenge it can be to create something new and modern yet still appropriate for the occasion. Which is exactly why you’re going to love today’s feature! 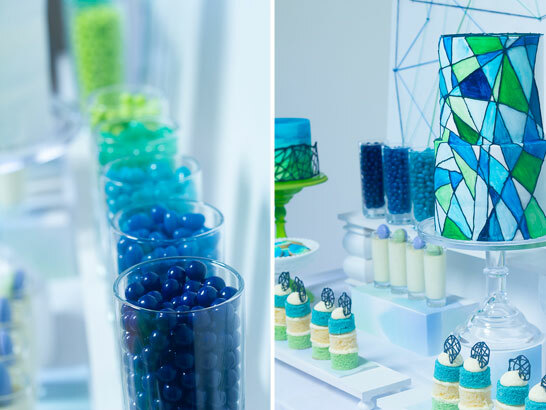 Shades of blue, navy and green bounce around this dessert table filled with vibrant color and style. 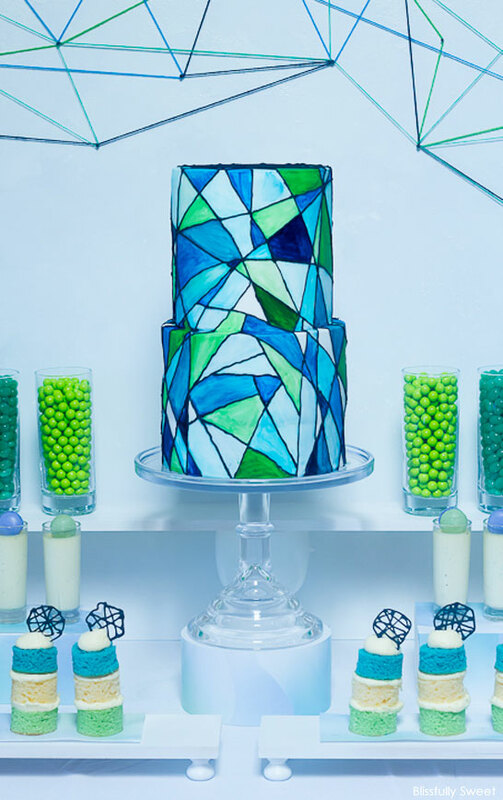 Inspired by the look of stained glass windows, Jacki Fanto of Blissfully Sweet created this dessert display for her son’s First Communion celebration. 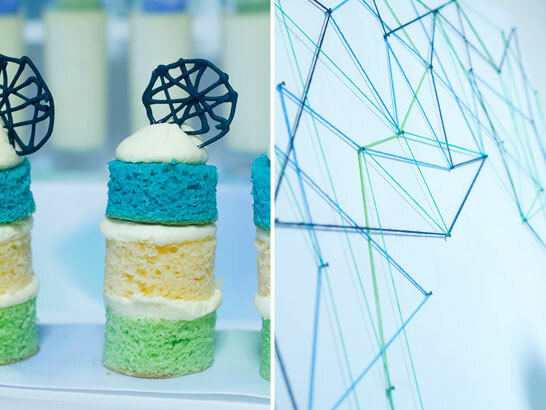 A custom ‘string art’ backdrop sets the stage while gorgeous watercolor desserts fill the table. 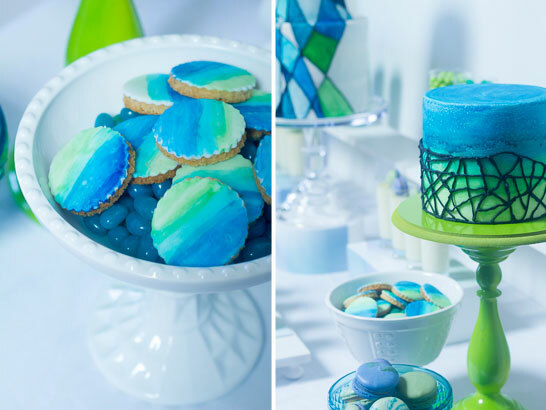 Treats like painted cookies, swirled macarons and petite layered cakes topped with little discs mimicking the stained glass look. And of course, a spectacular cake anchored the table. It’s a gorgeous spin on the decorative windows found in churches across the globe. 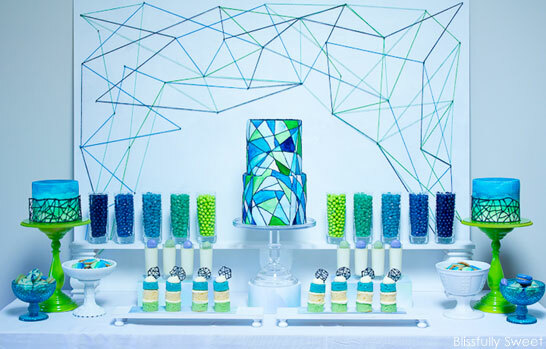 Filled with light and reflective beauty, it’s a stunning First Communion Dessert Table. 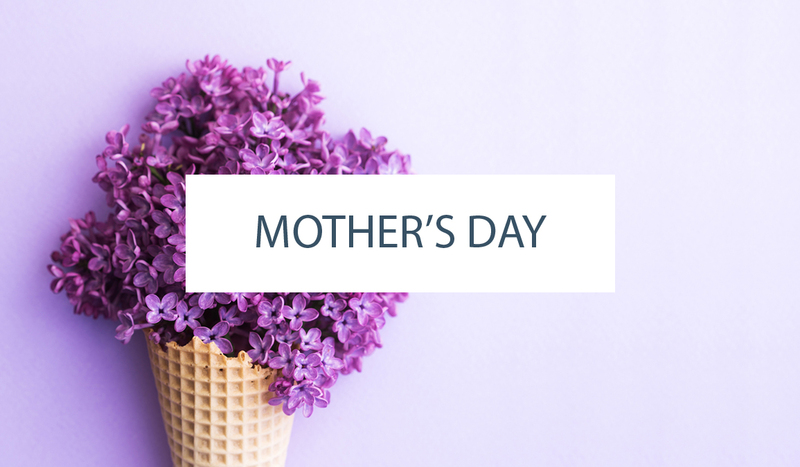 “With my son’s First Holy Communion I wanted to have a special celebration however I wanted the detail to not be overly in your face religious, but to still have the beautiful sentiment of the occasion. When I started thinking, I knew I wanted to incorporate an abstract pattern as the main design motif and when I started looking at pattern inspiration, I kept coming back to stained glass windows. What could be more religious than the stained glass windows of the church?? 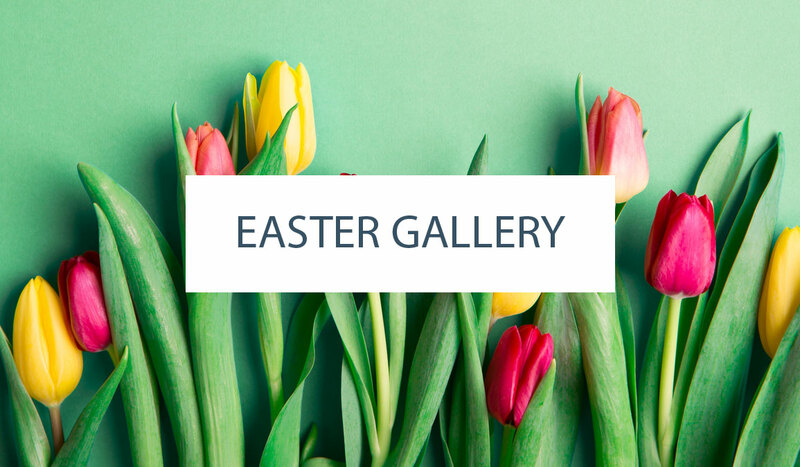 My go to girl for printables, Nicole at Pretty and Print took my idea and with my colour scheme of greens and blues matched with crisp white, I loved the simple and effective design that she made for this occasion. I always try and do something a little different when making my cakes or attempting to style my own tables. I did not want a usual backdrop, but something a little more dimensional but with clean lines. With the crisp white in my head, I knew I wanted to have the coloured lines to enhance the stained glass look. A friend reminded me about the “string art” projects we made at school and I knew I wanted to try that and with some simple hammering of nails and twining of strings, my backdrop was made. Always trying to find a DIY project or trying my hand at my own thing, I wanted to make some of my own risers and cake plates. The main riser at the back of the table is a long wood piece that I added some decorative wood feet to each end and painted white. The rectangle cake plates at the front of the table were made in the same way. This way I could design my own table and design the tableware around my thoughts. 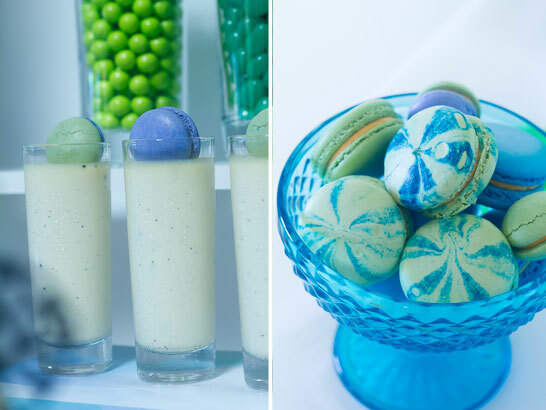 The green cake stands on each side are simple white candle sticks from IKEA with wooden circles secured on top and then painted in my lime green colour. All of it came together to make the clean look of the table that I wanted. My table was not a huge table and I needed to utilise my space and I did not want it cluttered at all. My riser at the back was used as the display piece for the coloured candy in my design colours. All the candy was supplied by Leanne at Sweet Style. No fancy glass candy jars here, just plain tall drinking glasses. Oh wow, this is incredibly stunning! Great representation of the stained glass and such a boyish and artistic look! This is so very Mondrain, but so much more beautiful!!! I love the blue green palette! Wow!! Simply spectacular. You could also use M&Ms in the glasses which can be printed with the child’s initials (and the date). Wow!!! stuning!! 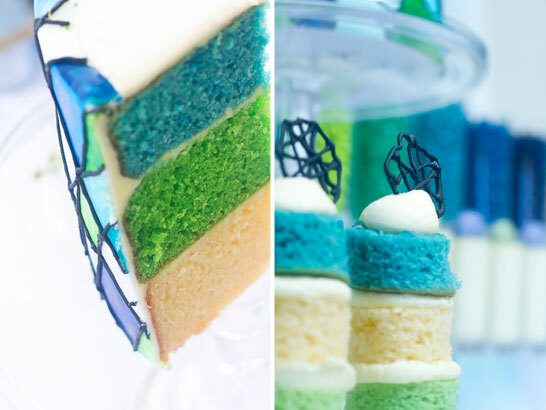 perfect color combination, perfect dessert, great cake, awesome!!! Love it!! !